I doubled this recipe and put them in the freezer. I tried to make fresh, but had problems with filling running out onto baking sheet, and under-cooking. I had no run or doneness problems with the frozen pies. DO NOT over fill or under cook no matter how you prepare your pies to cook! Double makes approximately 18-20 pies. Mmmm....better make a double batch! In a food processor (or with a hand mixer) mix cream cheese, butter, cream, granulated sugar and salt until smooth. Add flour and mix until a sticky dough forms. Cover dough snugly in plastic wrap; chill until firm, 2 to 3 hours. You can keep over night. Preheat oven to 350 degrees. Working on a floured surface, roll out half the dough until very thin. Using a bowl or glass, cut out 4-1/2” circles. Drop about 2 tsp of jam onto one side of each circle and top with 1 Tbsp of strawberries. Brush outer edge of circle with egg, then fold over to make half moons. Press edges together firmly and seal with the tines of a fork. Place on a parchment paper lined sheet tray and cut 3 small slits in each top. Brush with egg, sprinkle with raw sugar and bake until golden brown, 30-35 minutes. 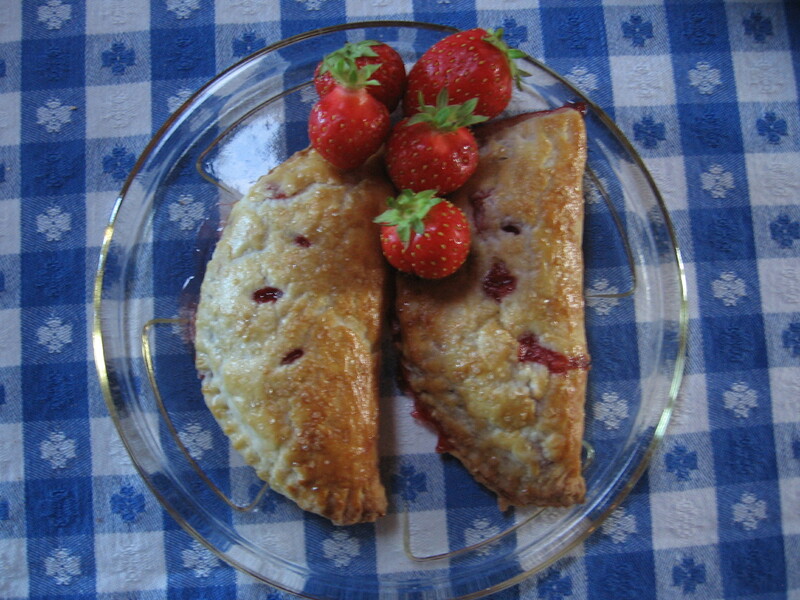 Got a favorite strawberry receipe? Please share it soon — I’ve got berries to use! !